In 2018, we made all the electricity we supply 100% green, at no additional cost, whether or not you were on already on a green tariff. Our SuperGreen tariff also offsets 100% of the carbon from the gas you use. Lots of people ask us how we can promise customers 100% green energy when we don’t generate it ourselves. There are a few different ways of being green. It’s not quite as simple as just buying energy from renewable generators and sending it straight down the wires to our customers’ homes. That’s for a number of reasons. Firstly, all energy — green and “brown” — is mixed when it’s fed into the distribution network through the National Grid. Secondly, the nature of renewable fuel sources ( i.e., the sun only shines in the day time, and wind is sporadic — even in this country) doesn’t always link up with our 24/7 energy needs. At the moment, one of the ways we ensure 100% renewable energy for our customers is by contracting directly with green generators around the country to buy their renewable energy — this is what energy folks call a Power Purchase Agreement (PPA). This massive farm in Nottinghamshire is our largest-generating PPA. It doubles as a riding school for local kids, who even ride along a track through the solar panels in their lessons. This solar farm is set on a large plot of farmland in the Hampshire town of Sherwood St John. 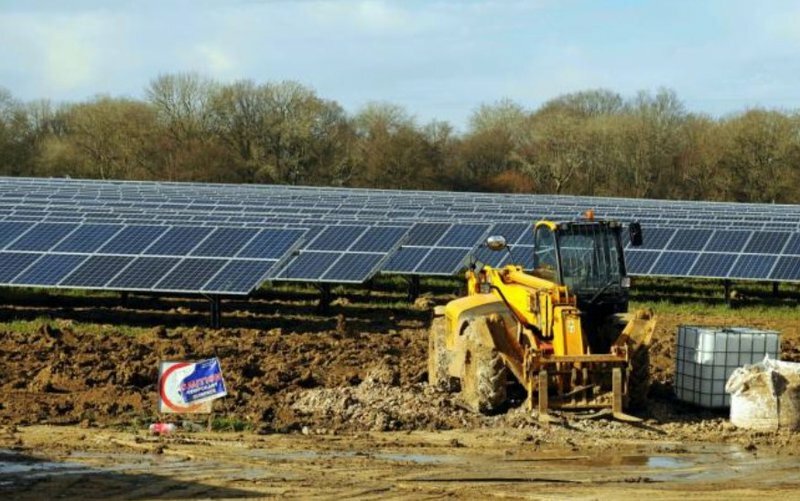 The local council decided to transform this regular bit of farmland into a solar site in 2014 (check out a picture of the farm's construction below). Hill End generates enough renewable power to save around 1,375,220kg of CO2 emissions per year. But we can’t buy all our energy like this.  Our challenge: the sun only shines at certain times during the day, and we need energy 24/7. We bulk-buy energy in advance to ensure we can offer affordable rates, hedging how much energy we think our customers will need over the course of a year. We can do this fairly well, thanks to years of historic energy usage data, and some pretty clever people. However, it becomes much more challenging trying to predict how much solar energy will be generated each day – particularly a day three months from now. Under, or overestimating the amount of solar energy we need, can be incredibly risky, and super costly. And we’re working really hard to hit that sweet spot between what’s good for the planet and good for your wallet. As we move further away from fossil fuels, one of the challenges we’re facing is how to make the best possible use of energy generated from the sun, or the wind – using what we can when generation is highest, and storing any excess to use when the sun isn’t shining. We supplement these intermittent generation sources (solar and wind power) with biogas produced through anaerobic digestion, which can be generated 24/7. This involves taking organic waste – from animal slurry to food waste to grass clippings – and heating it in oxygen-tight tanks to produce a green gas. Last year, almost half of our customers' energy came from anaerobic digestion (see our fuel mix here). One of our earlier blogs goes into great detail about exactly how we can ensure year-round cover from renewable sources thanks to a combination of solar, wind, and anaerobic digestion, visualising the mix against a typical UK home’s daily energy usage at different points in the year. NB: Recently there’s been some debate about the veganness of a fuel that uses animal byproducts (💩). Our energy specialist Grace, a longtime vegan and tireless environment activist, has written a really considered blog on this issue. On a good day, our direct solar contracts can power 80,000 UK homes. For the rest, we fulfil our 100% renewable promise by buying Ofgem-issued certificates, each signifying a megawatt (MW) of renewable energy that’s already been generated. Every megawatt of renewable electricity generated in UK is certified by the energy regulator Ofgem with a Renewable Energy Guarantee of Origin (REGO) certificate. For context, the average medium-consumption UK home uses a little over three megawatts of electricity each year. These certificates symbolise real renewable energy that’s already been generated. These are given to the generator, and can be sold either along with the energy itself, or on their own, to energy suppliers like us. Every year, energy suppliers have to publish where they’ve sourced their electricity from (their ‘Fuel Mix’). When it comes time to disclose this Fuel Mix, suppliers use the REGOs they’ve purchased as proof of their renewable credentials. 100% green energy suppliers purchase enough certificates to cover their customers’ energy usage, and then buy energy wholesale – meaning the non-green energy distributed to their customers’ homes is offset by existing renewable energy via the certificates they’ve bought. And that’s all buying green energy means, anyway – because all generation is mixed on the grid, buying “green” just means you’re paying for a commitment by your supplier to put green electricity into the grid, to cover what you use, ultimately “greening” it up so the UK’s national fuel mix slowly heads towards carbon neutral. We buy enough of these certificates to cover every single unit of energy our customers use. This means that our customers’ demand on the National Grid is only met by renewably-generated sources. Imagine a shared office biscuit cupboard (the UK grid), constantly stocked with around 70% fig rolls (turgid, taste like they're 1000 years old: the fossil fuels of the biscuit world, clearly) and 30% jaffa cakes (sunny, benevolent – renewables). The biscuits are all sourced by a few generous souls in the office who can be convinced to do the shop run, stocking the cupboard with people’s personal orders as well as a bikkies for everybody. They’re the generators. The office biscuit-eaters are energy suppliers. They're free to take biscuits, or add them, to the cupboard. But either way they have to pay for what they eat. Some will only eat jaffa cakes, as they want the best for themselves and the people around them. Others absentmindedly chew through whatever biscuit is available when they’re peckish, eating a combination of fig rolls and jaffa cakes. Mostly fig rolls. We want better for these people. Say you’re an office biscuit eater, and a strict jaffa cake purist (like us!) There’s a few ways you can guarantee you a) get your biscuits, b) pay for them and c) make sure everyone knows you’d never touch a fig roll. A REGO is like taking the amount of jaffa cakes you need from the existing supply in the shared biscuit cupboard, and slapping the money down on the kitchen bench. With a guaranteed supply, there's no risk with this method. Comparatively, with a PPA, you have to guess how many biscuits you’ll eat and buy them based on some complex hedging. And if you over- or under-order, it can be really costly (if you undershoot, a biscuit-buyer might charge more for the inconvenience of an emergency midweek biscuit top-up. If you buy too many, they might spoil). With REGOs, you’re buying biscuits that are already in the shared cupboard, meaning you've got safe access to guaranteed jaffa cakes. 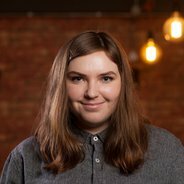 The REGOs debate: what are the supposed drawbacks? As well as buying REGO certificates alongside the renewable energy they represent, there's a separate market for buying the certificates on their own. Meaning, suppliers don’t always have to buy the energy itself – just the REGO certificate representing it. Some argue that this means suppliers aren’t really encouraging new renewable generation, which is what we’re all aiming for in pursuit of a decarbonised grid. Plus, there’s less of a clear, traceable line from source to supplier to consumer – these certificates represent renewable fuels that have already been generated rather than buying energy to feed into the grid. And ideally, we want to pay generators directly so we can begin to encourage more renewable generation and green up our grid even further! REGOs can only exist if a megawatt of renewable energy has already been generated. REGOs might not have such a direct source, but behind every REGO, clean, green energy has been generated in the same amount to power people’s homes. Also, REGOs are a strong and growing market. For investors, the incentive of another revenue stream through selling these certificates is really compelling, which naturally leads to more investment in new renewable generation. Which means that REGOs absolutely do encourage renewable generation. Slowly, people are starting to realise how tasty jaffa cakes are, and how easy they are to get. In turn, the biscuit suppliers in the office are encouraged to buy more to meet the strong consumer demand, and more investment goes into the market. Currently REGOs are the most reliable way of ensuring 100% renewable energy. We believe they're are a good first step in the journey to 100% green energy, getting people used the idea that you can go green without breaking the bank. As our dependence on fossil fuels decreases, and technology improves to move us ever closer to the low-carbon future we need, we’re looking at ways of making the most of solar energy. Businesses, for example, have an energy usage pattern much more in line with solar generation times (9 to 5 links up pretty nicely with sunrise to sundown) – so the potential for real-time energy matching is real for businesses. We offer Leicestershire businesses localised renewable energy from a nearby solar farm, and are looking to offer local, traceable green power like this in a number of different spots around the UK. We’re also designing technology to make renewable energy work for consumers. Energy storage solutions are on the rise, from established technologies like pumped hydro storage, to more cutting edge developments such as vehicle-to-grid charging, which will see two-way electric vehicle batteries power homes in times high demand and low generation. Towards the end of 2018, Arsenal Football Club, our long-time Premier League partner, launched a UK football first at Emirates Stadium – a 2 MegaWatt battery storage system with enough capacity to power a whole game at the Emirates with stored renewable power, from kick-off to full time. This battery stores energy when solar and wind generation are cheap and plentiful, and when energy demand is low. Then, when energy is most expensive, and most in demand (4pm to 7pm daily), Arsenal’s evening game runs on battery power, easing strain on the grid by the equivalent of several thousand household’s worth of energy. At peak periods when there’s no game on, the stored power can also be fed back into the grid to help reduce high energy demand – so there’ll be times coming up when UK homes are being powered, in part, by Arsenal FC energy, straight from Emirates Stadium! This truly innovative collaboration has picked up tons of major national press from The Guardian to ITV, and even made it into international news, including Forbes, Bloomberg, and CNBC. Seriously cool stuff. Thinking long term, we aim to supply all our customers' energy from source – actually building our own renewable farms, and forging a deeper connection between us and our renewables suppliers. We’ve already made inroads into this through our main backer, Octopus Group. OG is the UK’s biggest investor in onshore large-scale solar (meaning generation sites not at sea, and not on house roofs). They have over 150 sites across the UK, mainly comprised of solar farms. Though Octopus Energy don’t directly own those sites, these solar farms are central to our relationship with Octopus Group. But the wheels are turning on some proprietary Octopus Energy sites – we’re already in talks to make our own renewable farms happen, and while we say ‘longer term’, Octopus Energy’s first few years in operation have been characterised by speedy, massive growth (from 0 to 450,000 customers in our first two years) and nothing’s slowed us down yet. Having our own generation sites, similar to PPAs, will mean a higher and higher percentage of the National Grid is comprised of renewable fuels, meaning that by and large, people are consuming cleaner, greener energy without even knowing the difference. We fulfil our 100% renewable energy promise through a combination of 1) buying energy through direct contracts with renewable generators (PPAs) and 2) buying Ofgem-issued REGO certificates, each signifying a megawatt of renewable energy they’ve generated already. We always have our eyes on ways to ensure a more traceable, direct, and transparent energy procurement process. One that actually encourages more renewable energy to be generated, meaning a greener grid for everyone, staunch Jaffa cake purists and come-what-may fig roll munchers alike. Right now, hitting that sweet spot between “good for the planet” and “good for your wallet” is our priority, because we firmly believe that green energy shouldn’t be a niche product. We need to switch as many people as possible to renewable energy to ensure our low carbon future, and the only way to do this is by offering it at prices accessible to everyone.